If I could eat Peranakan dishes every day of my life, I would. 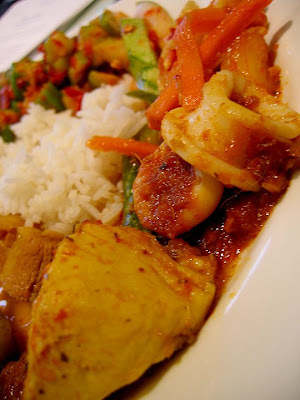 It is no secret that I love Peranakan cuisine. I am known for licking buah keluak remnants off plates (both discreetly and not-so-discreetly). Some know me as the chilli-ninja, for my ability to polish off sambal belachan, chilli padi or anything with chillies in it, faster than you can say “hot stuff!” Others are amazed at the number of buah keluaks (black Indonesian nut) I can consume in one sitting. So why is it that when I am asked to recommend a Peranakan restaurant, I blank out? It is simple, really. I was born with a curse, one that forbade me to name other Peranakan food as being better than my Dad’s. 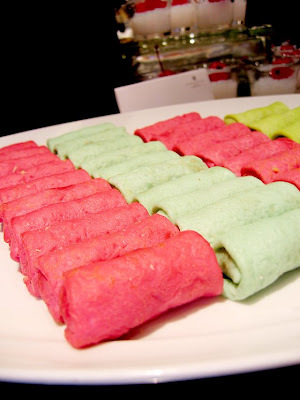 Brainwashed to believe that my family’s version of everything Peranakan as the best and nothing less, I obediently shut out whatever I heard of Peranakan cooking outside my home. I in turn, dutifully proclaimed to my classmates, cousins and friends that Dad’s cooking is fit for the Gods (doesn’t matter which) and that no one’s cooking comes close. Most believed me. Especially those who have tasted Dad’s cooking. You should see the megawatt on my Dad’s face whenever I listed out all the compliments my friends lavished about his food. It did not matter if it took him the entire day to make the rempah or fill the buah keluak shells. Whatever fatigue he had melted away when he hears about or sees the satisfaction on the faces of those who eat his food. Okay, so I wasn’t brainwashed or cursed or forced to believe that Dad’s cooking was the best. But that was how it was and still is. 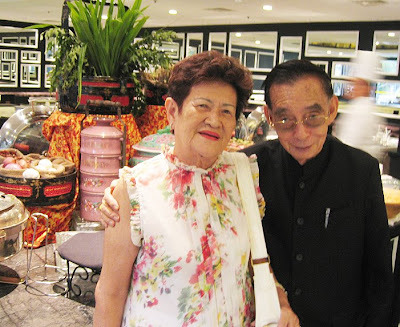 I am unable to tell you which is the best Peranakan restaurant in Singapore because deep down in my heart, I believe that Dad cooks the best Peranakan food. I do not hide the fact that I am partial towards Dad’s cooking. All my friends know that and they don’t dispute my claims. Instead, they try to get invited to my place to taste his cooking. All who’ve tasted have left convinced. Convinced that I was right. Right about what? Oh, do I really have to repeat it? I hope I’ve gotten your attention there, because some day, when Dad opens his restaurant, I want you to be there, to taste his food and to judge for yourself, whether or not I was lying. In the mean time, for the sake of all those who are dying to try authentic Peranakan cuisine but do not know where to start, you’re in luck. Uh, no, I am not going to start inviting you to my place to sample my Dad’s cooking (although I really wouldn’t mind!). 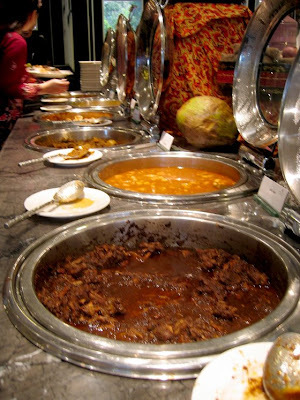 I want to introduce to you a fantastic and absolutely delicious Peranakan experience made possible by Spices Cafe at the Concorde Hotel Singapore (formerly Le Meridien Hotel). For once, I can finally give an answer to those who ask for a Peranakan restaurant recommendation. 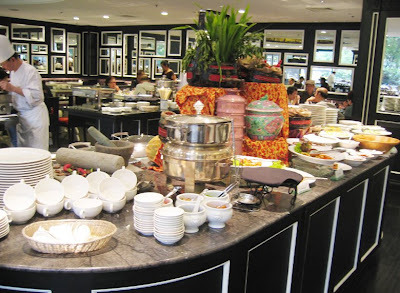 I was invited by the lovely people from Concorde Hotel to come try their very special Peranakan lunch buffet. 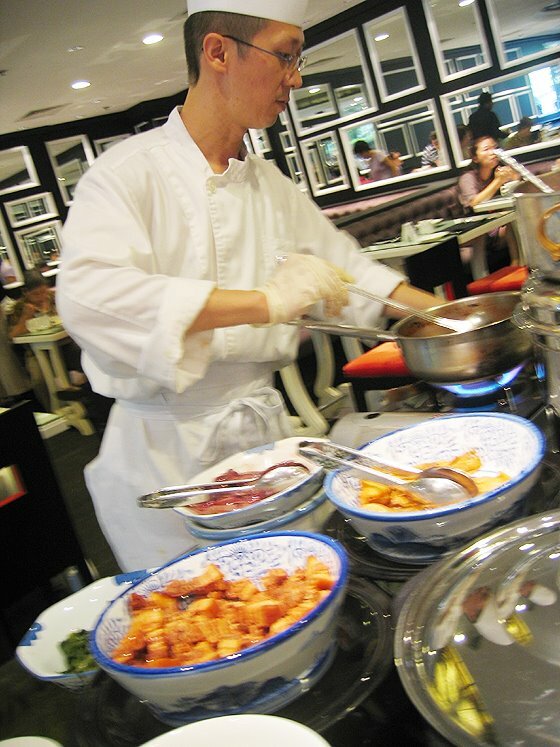 Launched in July in support of the Singapore Food Festival (which also honed in on Peranakan cuisine), the hotel had engaged renowed local Peranakan cooking expert Baba Jolly Wee to helm the kitchens at Spices Cafe. 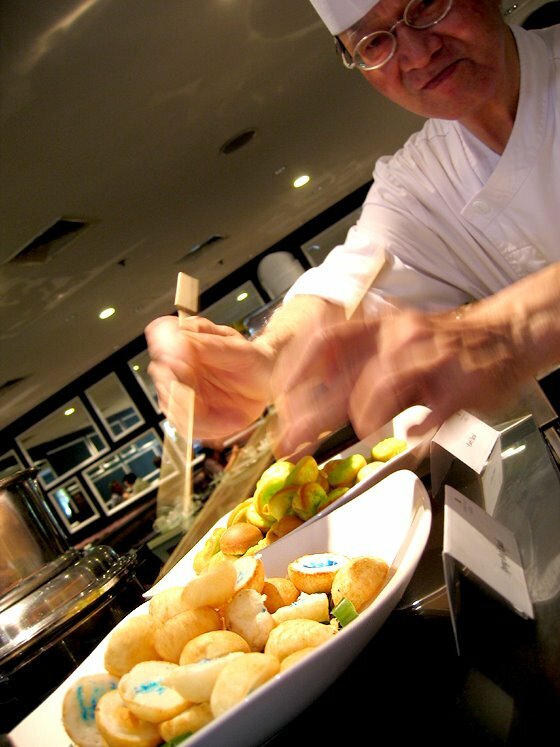 The sprightly 82-year old saw to it that the team chefs executed each dish in the most authentic way possible. I went, I saw, I smelt and I tasted and I am here to report that it was truly enjoyable. The proof is in the taste of course, so after perusing the below photos, please head down to the cafe to bite into the super delicious babi assam ((tamarind marinated braised pork)) and slurp up the fragrant itek tim (duck in salted vegetable soup). A wide selection of Peranakan favourites that include buah keluak, rendang, sambal sotong, and a whole lot more. It is advised that you call the cafe in advance to check what’s on the menu that day because the variety can change. 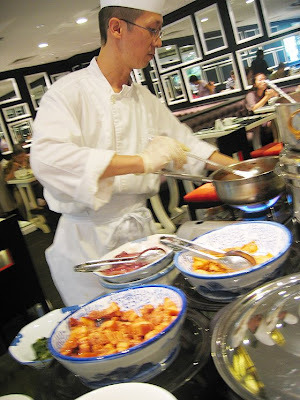 One of the chefs preparing a ‘lost dish’, known as loh kai yik, which is really a Cantonese dish made of chicken wings, chicken liver, fatty pork, pig’s intestines, stomach and skin stewed with nam yu (red fermented beancurd) and garlic, then served with blanched kangkong. What used to be a popular dish served by street hawkers in the 1960s and 1970s is soon to be extinct. I have heard a little about this dish but never got down to really researching about it until now. There is apparently only one place that sells it; at People’s Park Food Centre. I’ve tried it before but I have to say that the version by Jolly Wee is much better. Listening to him reminisce about those days when he will run out to buy a bowl when he heard the street hawker pushing his cart towards his house is such a treat. You know how passionate he is about his food when you see his face lighting up as he chats about how great food comes from the heart. Baba Wee is a kind and sincere soul. During our conversation, he told me that it’s really the passion and not the money that keeps him going. Why else would he still be in the kitchen at 82-years old when he can easily retire and stay at home? 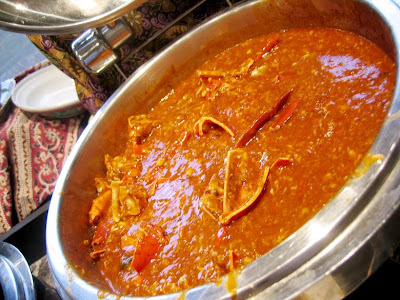 The chilli crab was so good, there was none left for me. They refilled it later on. But I was too full by then! My parting shot – a lovely photo of Baba Jolly Wee and his charming wife. She arrived mid-way our conversation and she gamely agreed to be photographed when I asked nicely. What I had at Spices Cafe wasn’t just a Peranakan feast, it was a history lesson. A part of me felt ashamed as I tried the many Peranakan dishes. I had stepped into Spices Cafe slightly sceptical, wondering if the food would be as good as my Dad’s (that’s the truth. I cannot help it). Then the smell hit me. I could smell it the minute I stepped into the restaurant. It was a familiar scent, a scent that made me inhale deep. It wasn’t before long that I understood what it meant. To me, it was the scent of authenticity. It was as though I had stepped into my own kitchen, with Dad at the helm. This meant only one thing – I have found a restaurant that serves Peranakan food not far off from how my Dad does it. The dishes are not the same (I believe every Peranakan cook has his/her unique style that’s quite hard to put a finger on) but the heart and soul is. That is after all what good Peranakan cuisine is about anyway. P.S. The Peranakan buffet is available until the end of December 2009 so make sure you try it before it ends.